Union members deliver a letter to ITV Studios urging them to make a deal with the WGAE (ITV staffer at far left, in red shoes). ITV Studios just paid $360 million to acquire Pawn Stars producer Leftfield Entertainment, capping an 18-month acquisition push which, according to the company, makes ITV the largest independent unscripted TV producer in the United States. ITV also paid its CEO, Adam Crozier, £8.4 million last year, far above the UK average, and is getting blowback from shareholders on that issue. ITV clearly sees how profitable it can be to produce nonfiction television in the US. These profits come largely from the exploitation of the freelance producers who actually craft the shows ITV airs and sells to networks like A&E, E! and National Geographic. Now the WGAE, the AFL-CIO and others are calling on the British conglomerate to improve benefits for its American workers. The guild is seeking minimum levels of compensation, health benefits and paid time off. 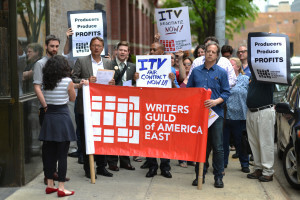 At least 100 writer-producers work at ITV Studios at some point during the year; currently, ITV employs 40 WGAE members in New York. New York City Councilmember Corey Johnson, whose district includes ITV’s New York offices, also called on executives to sign a contract. He said creative workers are essential to the New York City economy, and should not be exploited by a business model built on long hours for substandard pay and no benefits. He applauded the efforts of ITV’s producer-writers to win a union contract that would allow them to build sustainable careers, strengthening the City’s middle class for years to come.